From the summit of Mount Lofty there is a viewpoint and restaurant with spectacular views over Adelaide. Mt Lofty Botanical Gardens is 1.5km south. Open 8am to 4pm weekdays, 5pm weekends. Cleland Wildlife Park is a popular Australian wildlife park. Open 9.30am to 5pm daily. Entry $7. From Adelaide take bus 822 from Grenfell St.
Warrawong Sanctuary has Australian wildlife in a 35 acre rainforest and stream setting. 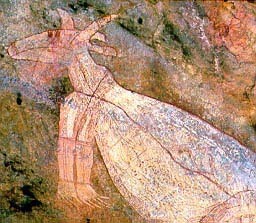 There are guided walks at dawn and dusk for $15; book in adavnce. Stock Road near Mylor. Take the Stirling exit from the Princes Fwy and follow signs. Phone 8370 9422. Hahndorf is an old German town in the hills that now takes advantage of its history to cater almost exclusively to tourists. On weekend the town is overun with them. The main street has many craft and sounevier shops and German restaurants in the original old buildings. There is an art gallery at 68 Main St (phone 8388 7250) and a couple of Lutheran churches in the side streets. Despite the tourists the town is a very pleasant place to visit for a couple of hours. The German Arms Hotel is a pub with lots of atmosphere and good Geramn food. Hills Transit run a few buses a day to hahndorf from Adelaide. Fare $4.10. Phone 8339 1191. 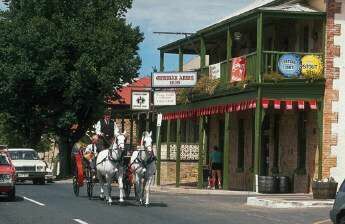 Picture: Historic Hahndorf, settled by Germans. The German Lutheran atmosphere is still strong. The National Motor Museum has hundreds of historic cars and motorbikes on display. Main St. Open daily 9am to 5pm. Closed Christmas Day. Entry $8. Phone 8568 5006. North to the Barossa Valley wine region. Return down the hills to Adelaide. To Portland and Warrnambool and then along the Great Ocean Road.